No matter what methodology you currently employ to boost productivity—whether it’s “voice-of-the-customer” analysis, Six Sigma, Lean, value-stream mapping, “Staple Yourself to an Order,” and/or balanced scorecard (KPI) implementation—The Lab can take your finance function to all new levels of lean with our finance transformation and process improvement service offering. You’ll slash labor costs. Increase revenue productivity. Turbocharge the customer experience. And you’ll do it all in just six months or less… without any new technology. That’s what makes our finance transformation model so unique—and so compelling. 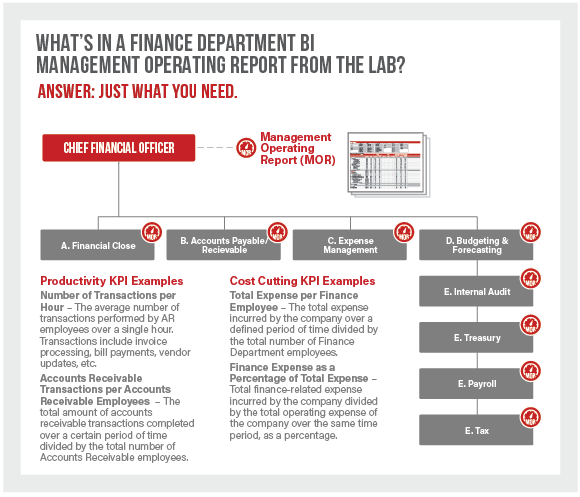 What is a finance transformation project and what does the roadmap look like with The Lab? The Lab has incorporated all of the leading process-analysis and lean-implementation methods into a single and cohesive finance transformation project methodology. We call it Non-Technology Improvement®, and it reduces all of the principal wastes that are common to finance and accounting processes—and which routinely squander up to 40 percent of finance operations productivity. It consists of two phases. In the first, we analyze. 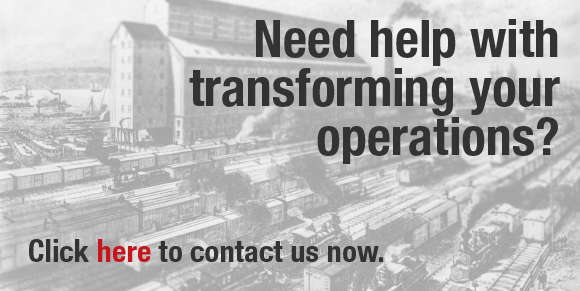 In the second, we implement and transform your finance operations. 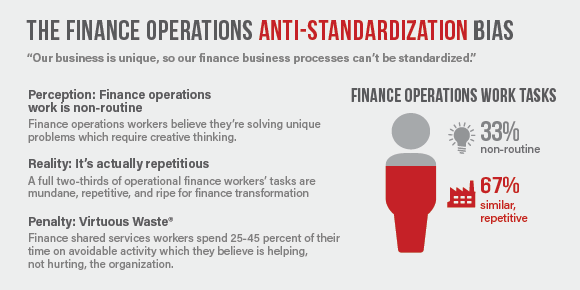 Finance and accounting operations knowledge work can be standardized with transformation. Today’s finance-function knowledge workers spend a third of their day on inefficient, redundant, and duplicative activities that could be streamlined, or avoided altogether. Up to 85 percent of reporting capacity in the monthly close process is squandered on low-value tasks such as data gathering and scrubbing. Only 15 percent remains for activities that executives focus on, such as analytical review and recommendations. Accounts payable invoice processing non-compliance rates for invoice-submission procedures typically reach 15 to 25 percent. That translates to twice the time required for rework. 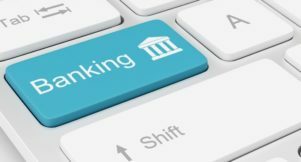 It’s all a side-effect of what we call “the anti-standardization bias”: the persistent belief that a business unit finance processes are so unique, that its knowledge work can’t be standardized. But that’s plain wrong. It was disproved 100 years ago on factory floors around the world. Operational finance work processes typically include nine different back-and-forth hand-offs between the business units and corporate finance operations before the work is completed. Do you think Henry Ford would have tolerated such reversals on the assembly line? 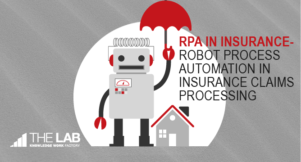 Best of all, the overwhelming majority of finance transformation process improvements which The Lab can identify and implement require no new technology whatsoever. 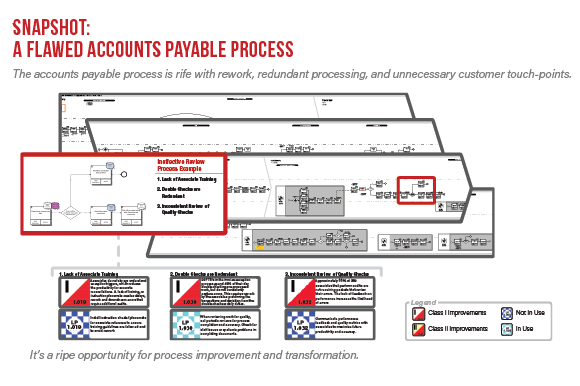 80% of finance and accounting business process improvements require no new technology. This is when The Lab dives deep, leveraging our world’s-largest database of finance transformation templates, and scrutinizing hundreds of discrete desk-level processes to find every one that offers opportunity for finance transformation through lean Non-Technology Improvement. The Lab maintains activity-level templates for thousands of organization-and industry-specific business processes. 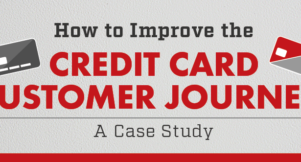 We have documented thousands of commonly recurring, activity-level operating improvements. Our database of best practices—both in your industry and in those of relevant others—is used to hone your operational capabilities. 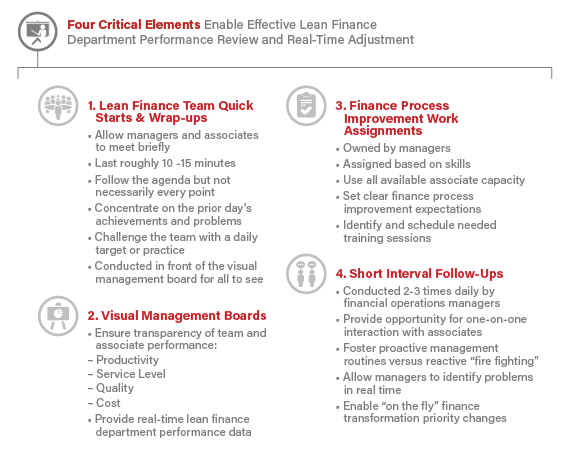 Scrutinizing at the minute-by-minute, desk-level of operations detail, The Lab will uncover literally hundreds of opportunities for finance transformation by implementing lean Non-Technology Improvement. Financial Close and Reporting Transformation – Up to 85% of capacity in the monthly financial close process can be devoted to low-value tasks such as data gathering, data scrubbing, etc. Only 15% remains for the tasks that line executives value most: financial analytics and operational finance recommendations. 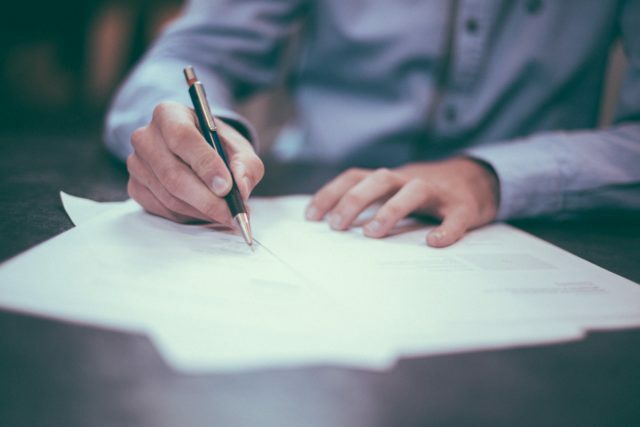 Invoice Processing Transformation – Accounting approval procedures and vendor certification requirements are frequently bypassed; no process exists for vendor rationalization. Results: Payment delays, multiple approval cycles, poor price negotiation, over-buying of standard items, unnecessary complexity for non-standard items. Cost Allocation Transformation– Complex and opaque cost allocations drive ongoing LOB questions, reducing the time available for cost-trend analysis. Typically, no formal procedures exist to facilitate challenges to allocations, increasing the workload and cycle time devoted to explanation, reconciliation, and LOB buy-in. Budget Management Transformation – Out-of-control line items, accounts, cost allocations,and financial budget calculations generate cascading LOB interactions, complicating data collection. Lack of revenue-to-state translation mechanisms, “what-if” tools, common submission routines, and budget ratio comparisons needlessly increases budget cycle times up to 30%. Internal Audit Transformation – Internal financial audits frequently fail to inform the LOBs of an upcoming audit’s time demands. The lack of prework checklists, rigorous scheduling mechanisms, and graph-based output all contribute to unnecessary, low-value time demands on business line leaders and staff. 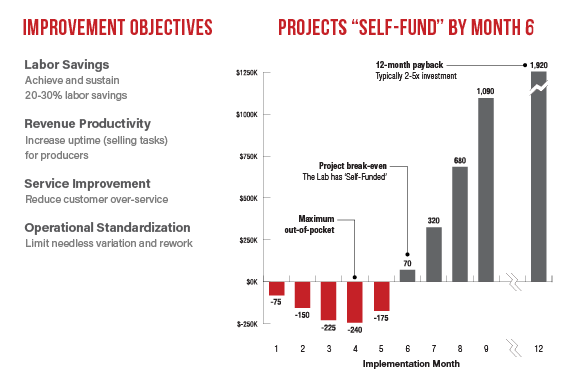 Wrapping up Phase 1: The Lab documents the self-funding process improvement business case and designs the finance transformation implementation project. While The Lab will bring about Non-Technology Improvement in your finance function in just six months, it’s not some grand unveiling or one-and-done. 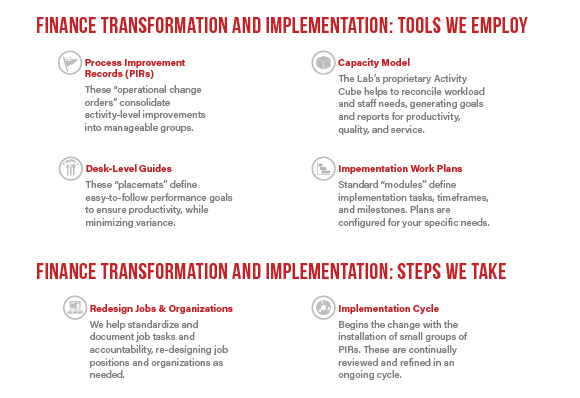 To the contrary: it’s a carefully planned and methodically managed finance transformation rollout which undergoes multiple iterations which ensure that lean management and process improvements deliver—and continue to deliver—the optimal outcome. We employ finance group participation. We attain stakeholder buy-in. We continually refine the process to yield the most powerful long-term results. But we don’t stop there. Since you can’t improve what you can’t measure, The Lab also monitors and continuously benchmarks finance transformation results to ensure that quality and productivity hit the numbers, quarter after quarter. We’ll design finance dashboards with KPIs that track volume, productivity, service, and quality. We’ll give you executive-level dashboards that let your finance managers drill down into detailed performance metrics, ensuring sustainability while enhancing continuous process improvement. The Lab’s improvements keep paying dividends long after the finance transformation engagement is over. 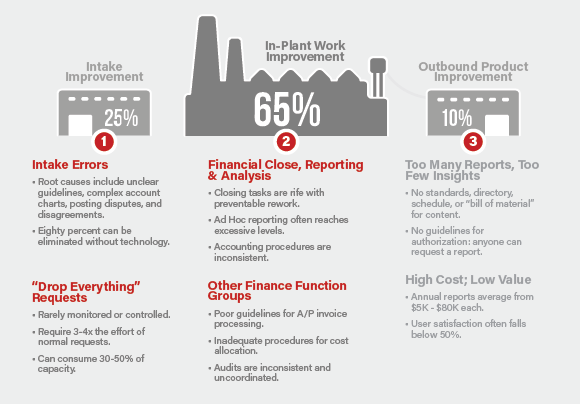 Recurring bottom-line finance operations improvement results: Recover 20% of earnings. 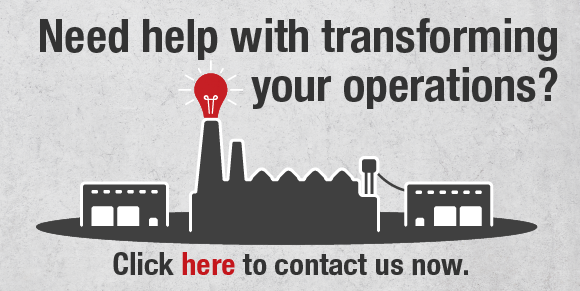 Are your finance operations in need of transformation within 6 months? Be sure to contact us here so we can help you immediately.